it’s easy to assume that this traditional Hanukkah dish is off limits because it is usually made with flour. If you are a guest at someone else’s Hanukkah table it is likely wheat flour will be used as an ingredient in the latkes. 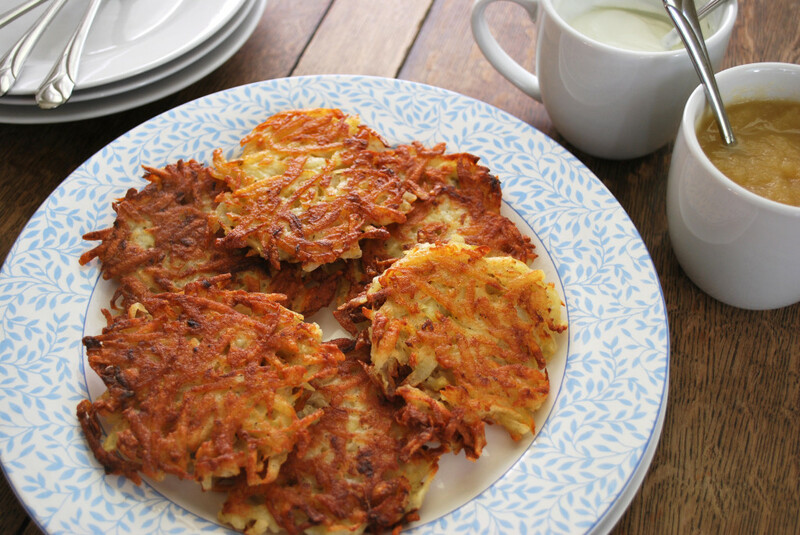 But if you make them yourself or talk to your host in advance, latke recipes easily allow for a gluten-free substitution. In the early years, I just used corn starch instead of flour. This can work for your host since most people have corn starch in their pantries. No need to buy an ingredient that’s expensive and might never be used again. Of course you would also have to mention cross contamination-issues – clean pans and utensils and fresh oil would be necessary. Gluten-free latkes taste as good as the gluten-containing kind so there’s no need to make both versions. Since I have plenty of gluten-free flour at my house, I now use whatever I have on hand. I prefer a flour blend because it’s less gritty than plain rice flour. But pretty much any gluten-free flour works. I also don’t worry about precise measurements. I work with the old latke recipe I cut from a newspaper soon after I got married and wanted to prepare Hanukkah dinner for my husband. It calls for shredded potatoes, eggs, flour and salt—some recipes also include onions. I slowly add gluten-free flour to the potatoes, eggs and salt, looking for a consistency that will hold together in the frying pan. When I think I have the right mix, I test fry a latke. If it falls apart, I add a little more flour to my mixture. I used to be a by-the-measuring-cup cook, but the gluten-free diet has taught me to trust my instincts. If something looks too soupy or too dry, I’m no longer afraid to tinker until I feel comfortable. This often works much better than when I proceed with recipe directions despite my sense that something’s not right. It’s not foolproof, but my successes outweigh my flops. 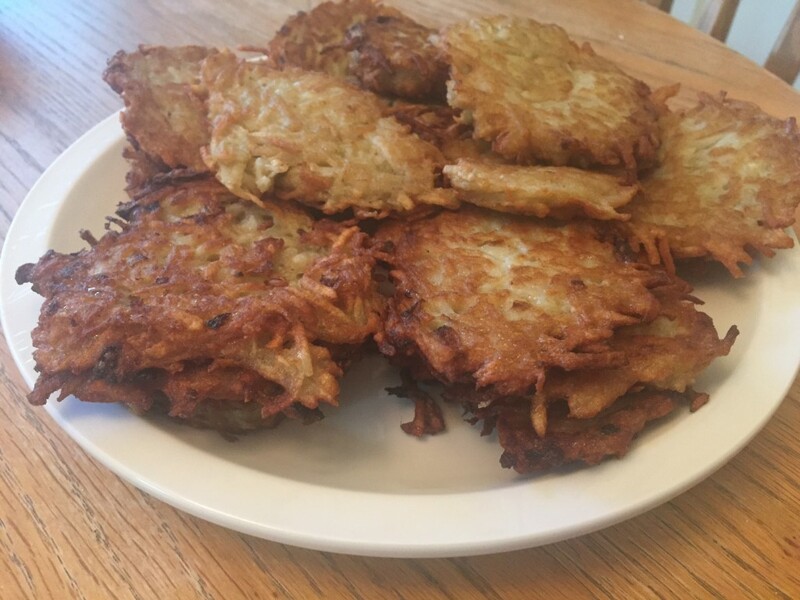 Latkes are forgiving, so recipe alterations work particularly well. I’ve even made them with no flour at all, upping the number of eggs to hold everything together. But I prefer the consistency when I use gluten-free flour. Although nothing tastes quite as good as a latkes fresh from the frying pan, they do heat up fairly well, so you can make them in advance and take them to your holiday dinner. I fry my latkes, put them on a plate lined with paper towels to soak up the extra oil, then move them to a baking sheet and freeze them. Once frozen, I put the latkes in a freezer storage bag. To reheat, I put them back on a baking sheet and then pop them into the oven until they’re hot and crisp again. If you still feel like you need a recipe, you’ll find one here. I hope that this Hanukkah, which begins at sundown on Sunday, you and your family enjoy all the traditions of the Festival of Lights, including the latkes.